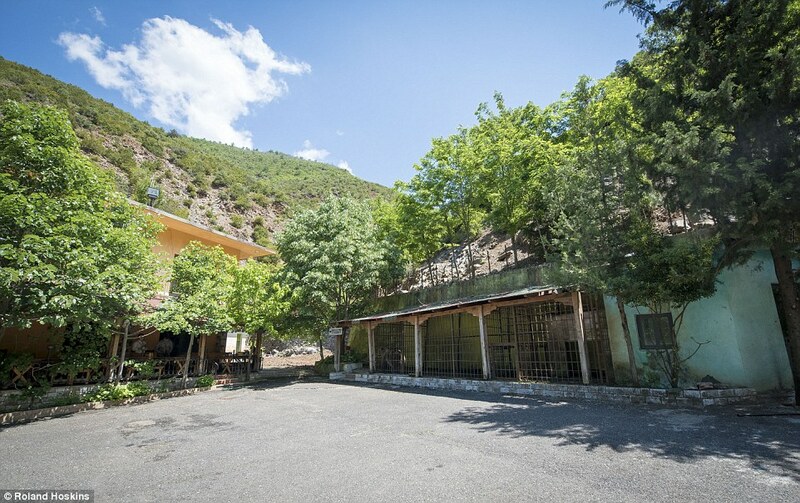 Disa kilometra larg Tiranës në një restorant në malet e bukura të Shqipërisë mbahet i mbyllur në kafaz një ari i vetmuar dhe i dëshpëruar. Kjo është pasqyra që Daily Mail bën për ariun që me forcë është zhvendosur nga pylli duke u detyruar të jetojë brenda një kafazi dhe të argëtojë turistët që e vizitojnë. ‘’Ata filmojnë video me smartfonët e tyre, bëjnë selfie dhe nëse janë në humor e ushqejnë edhe me ëmbëlsira dhe patetina, ndërkohë që pronari ndonjëherë i jep birrë që ai të shuajë etjen. Humori i ariut Tomi është i luhatshëm. Ndonjëherë më të dëgjuar erën e ushqimit ai lëviz në drejtim të vizitorëve dhe i vështron ata me shpresën se do t’i japin diçka. Në raste të tjera ai lëviz i dëshpëruar në kafazin e tij të vogël duke goditur veten me gjymtyrët e tij’’, shkruan britanikja. Reliant on the generosity of passers-by for his daily diet of junk food, he cuts a lonely and desperate figure. 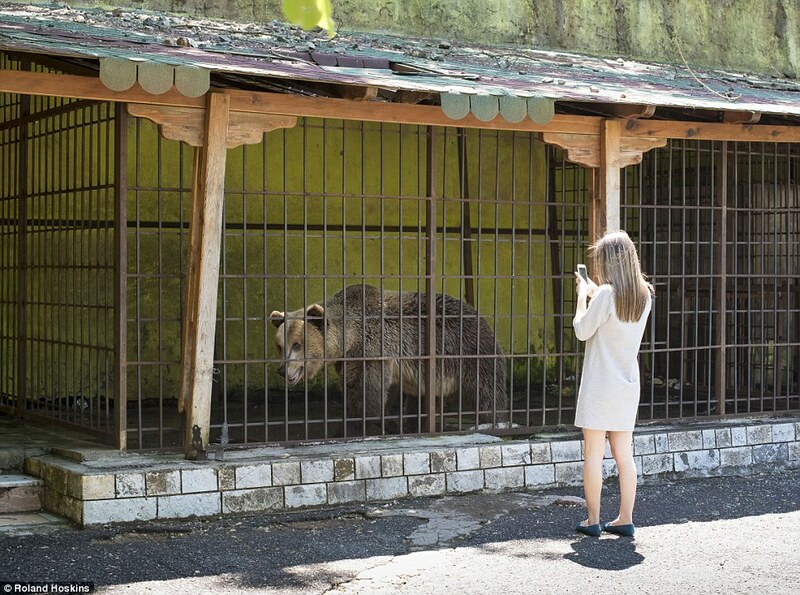 Crowds flock to see Tomi the brown bear in his ‘home’ - a tiny cage next to a run-down restaurant in beautiful mountains 40 miles north of the Albanian capital Tirana. They take videos of him on their smart-phones, pose for selfies, and if feeling kind give him sweets, cake and crisps. His owner occasionally gives him beer to quench his thirst. Sometimes, when he can smell food, he cups his paws in a begging motion and gazes hopefully in the direction of the customers. Occasionally he puts his jaws through the iron bars and sticks out his tongue, clinging to the hope that someone might feed him. In other moments, he paces around his cage intensely, and then goes into what appears to be a self-harming spasm – biting his limbs while shaking his head violently. His owner blames the distressing behaviour on ‘boredom’ but insists there is nothing wrong with locking up Tomi for 24 hours a day. 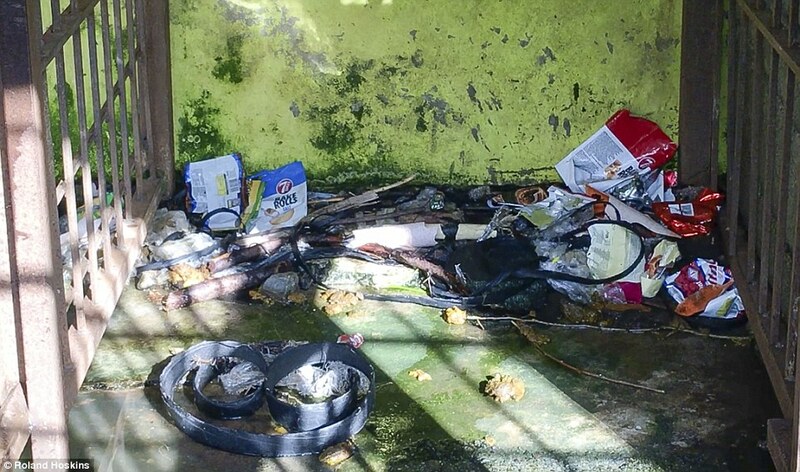 An animal welfare expert said it is the result of ‘extremely monotonous and confined living conditions’ which, he added, are ‘unbearable’ for him. Until two years ago, Tomi roamed the mountains, woodland and river across the road from the eatery where he is now a very reluctant tourist attraction. Then the man who runs the restaurant, who refuses to reveal his name, came up with his sickening idea of taking the bear out of his natural habitat - in a bid to boost takings. He said he paid a vet to hunt Tomi down with a tranquiliser gun. Sedated, the enormous animal, now five years old, was brought back to the restaurant and put in a 20ft by 10ft cage to attract extra custom. To add to his torment, a tank filled with water and trout for restaurant diners is situated just a few feet away, well within smelling range. 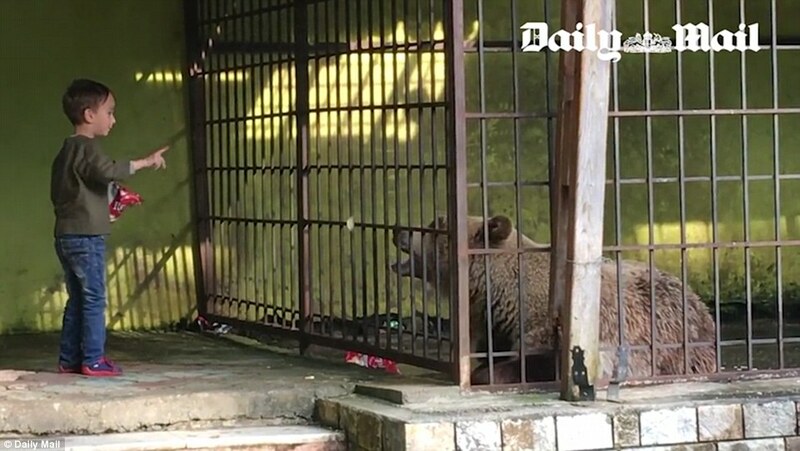 From his cage, which is full of litter including discarded crisps and sweets bags, the bear can hear birds singing and the sound of running water while chickens walk past him in the safe knowledge he can do them no harm. 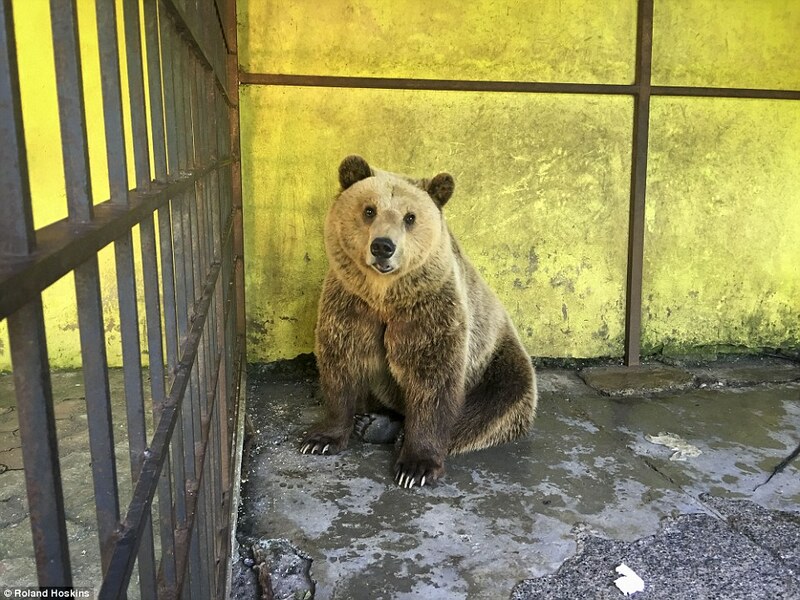 Tomi is one of about 80 brown bears thought to be trapped in cages at restaurants, petrol stations and beaches across Albania. 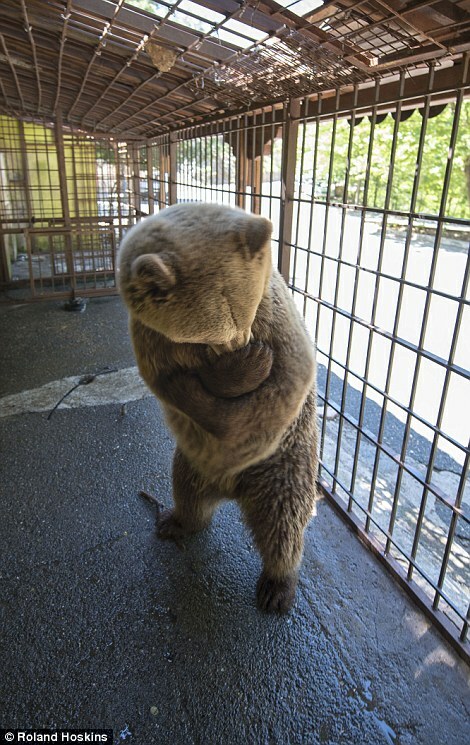 Some are forced to perform as dancing bears and incredibly live in even more cramped conditions than Tomi. 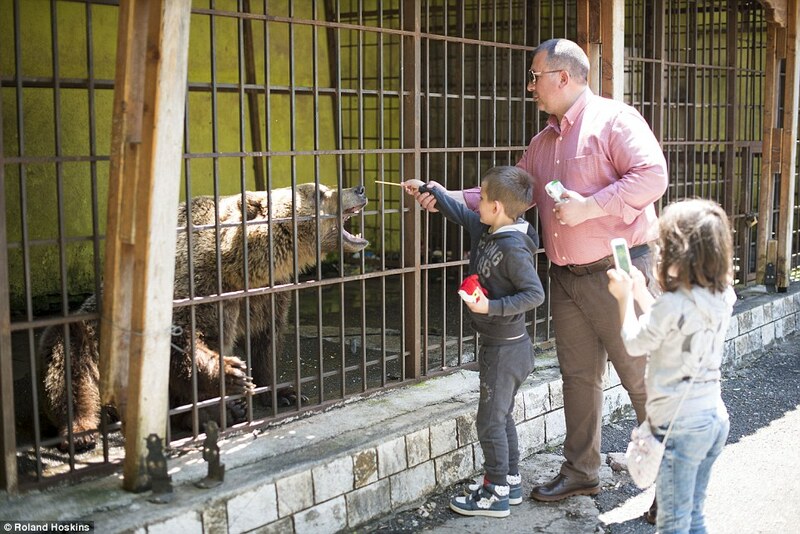 Campaigners have repeatedly urged the country’s Government to rescue them from captivity but despite numerous promises of action nothing has really happened and the Albanian brown bear is now a seriously endangered species. 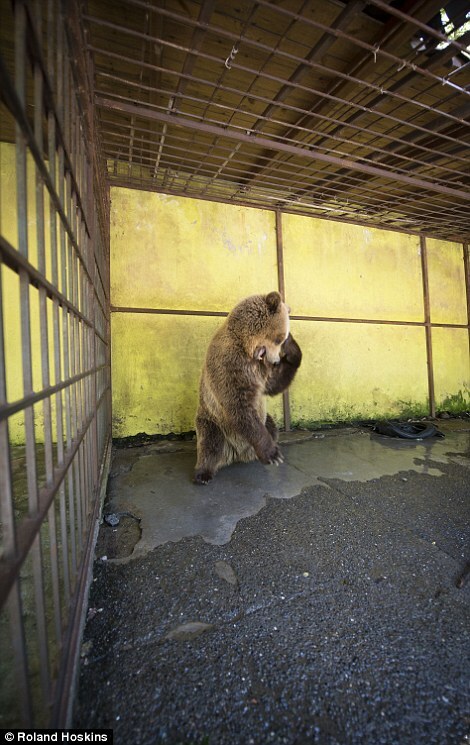 Only about 250 brown bears remain at large in the poverty stricken country (in addition to the estimated 80 bears living in cages). 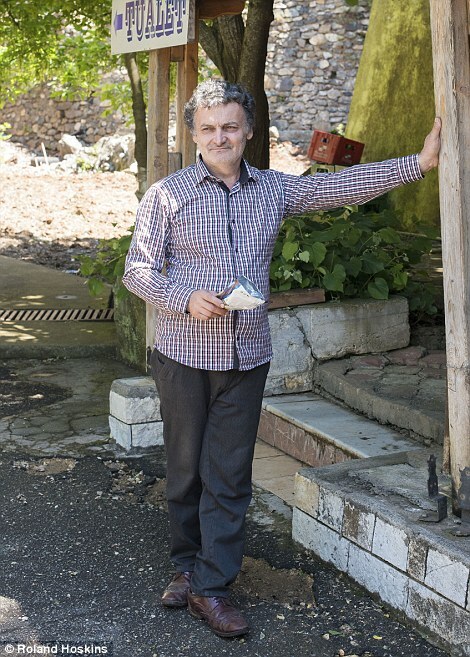 Daily Mail photographer Roland Hoskins and I stumbled on Tomi as we travelled through Albania on another assignment and over a period of two days witnessed first-hand his suffering. The restaurant owner, a married father of five in his 50s, was unapologetic about Tomi’s plight. As children and their parents fed him sweets, he said of his ‘pet’: 'Tomi is the same as a human being but does not speak. 'He is so used to human beings. Later, as Tomi became distressed and chewed his limbs and shook his head, the owner said casually: 'Sometimes he gets bored and does this. It's quite usual. 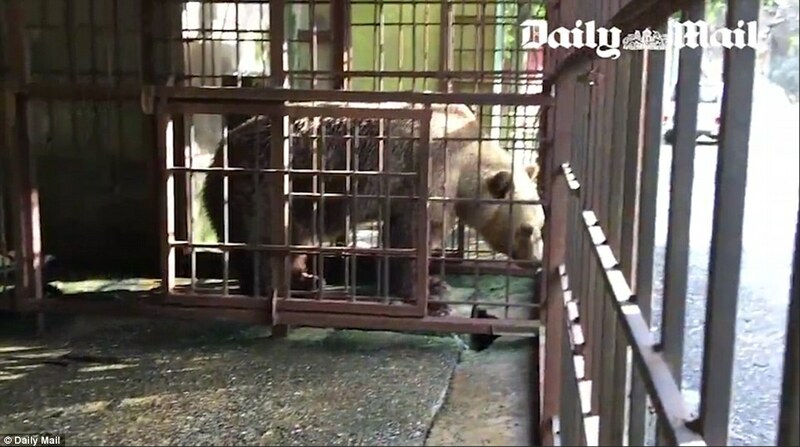 The Mail took extensive video footage of Tomi in his cage and showed it to an expert on the welfare of bears. 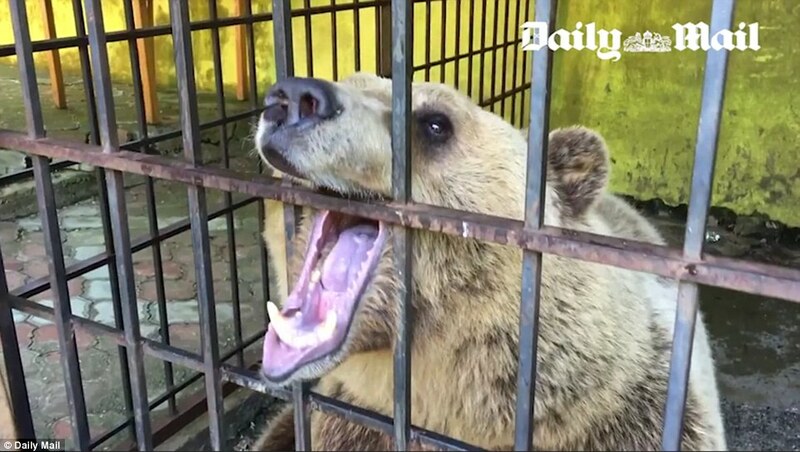 Zoologist Thomas Pietsch, of the London-based campaign group FOUR PAWS, said: ‘The bear shows a very strong behavioural disorder which is clear evidence of serious animal welfare deficits. This self-harming behaviour is clearly compulsive and is a result of the extremely monotonous and confined living conditions. 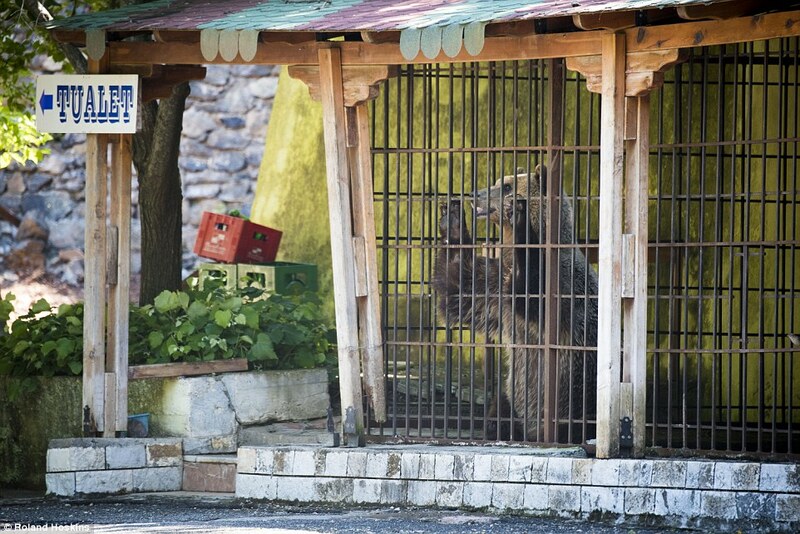 ‘In his small cage the bear is unable to express even the most basic natural behaviour. 'In this environment he is not able to follow his natural instincts, has no opportunity to move properly, look for food, climb, dig or take a bath. 'He also cannot retreat from the gaze of visitors and is forced to interact with them constantly and beg them for food. 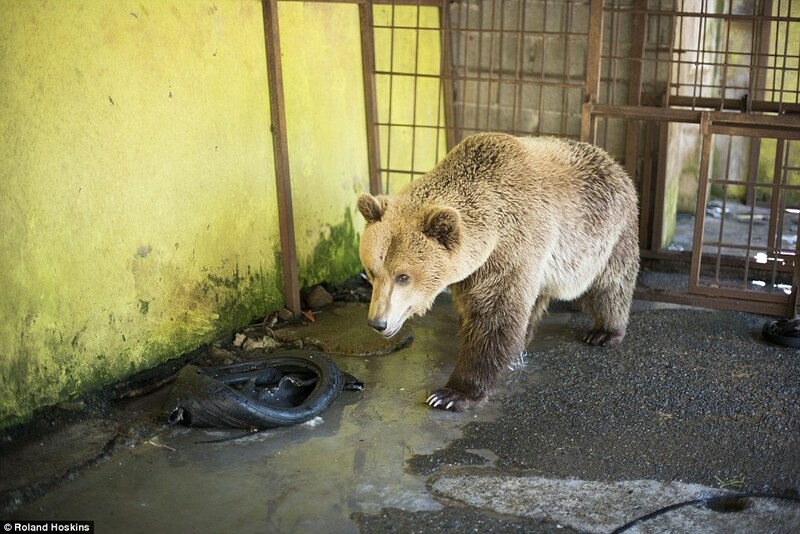 'This situation is unbearable for the bear and totally unacceptable from an animal welfare perspective. 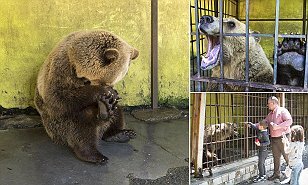 He added: ‘In Albania there are still dozens of brown bears kept in bad keeping conditions and used for profit and entertainment purposes. 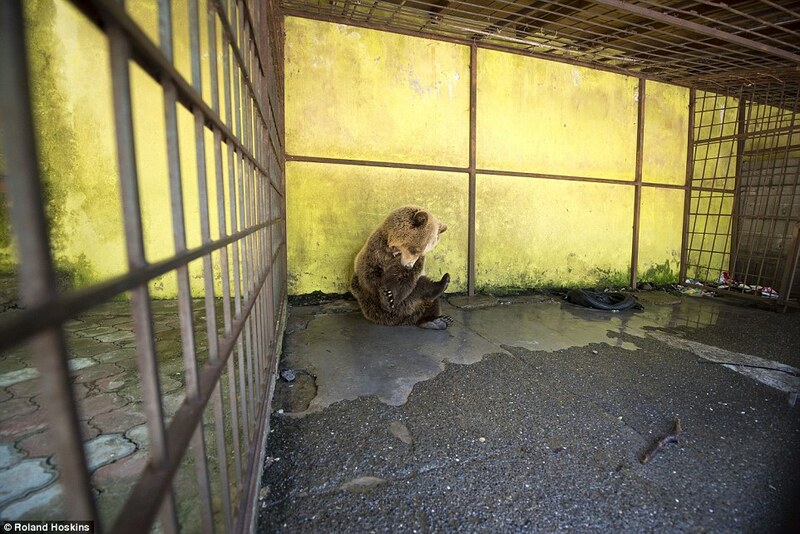 These animals are forced to live in small cages or chained up near hotels and restaurants or privately owned gardens and backyards simply for the amusement of people. 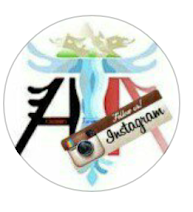 'FOUR PAWS wants to tackle this problem in cooperation with the Albanian Ministry of Environment. In a Memorandum of Understanding signed this year both parties agreed to work together on a sustainable and animal-friendly solution for these brown bears. But critics doubt whether the country, which hopes to join the EU in the next few years, will act on its promises. 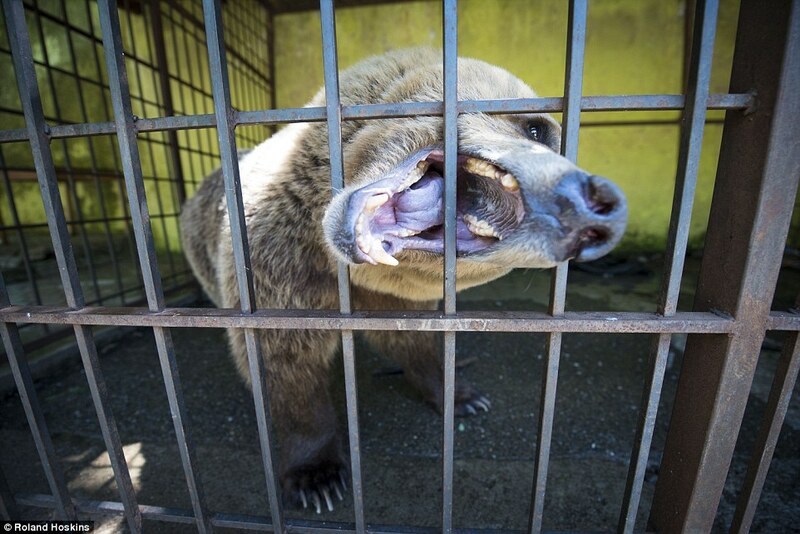 The campaign group, People Advocating for Caged Bears, said a multi-agency workshop was held three years ago on the issue of the ‘Illegal Capturing and Keeping of Brown Bears in Albania’. It added that a report 'concluded that, in general, people are not concerned with conservation, welfare or engaging in education with regards to wildlife and the environment. 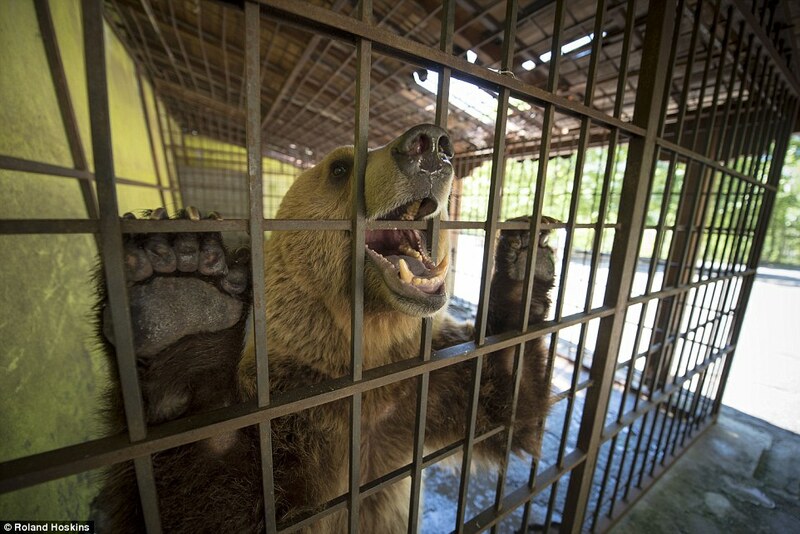 This may explain indifference towards the keeping bears in cages throughout the country. Campaigners hope the Mail’s report on Tomi will shame the authorities into action. For isolated and hungry Tomi, desperate to return to the woodland and mountains he once roamed freely, decisive moves to end his suffering cannot come soon enough.